Markets have been driven in recent years by risk, with high growth areas doing well. As the market begins to show some signs of fragility, Daniel Roberts, manager of the Fidelity Global Dividend Fund provides an update on the portfolio and explains how he’s positioned to take advantage of the quality bias in his stock selection, as value and more defensive areas of the market begin to come back into favour. In recent months, news flow has moved away from looking so closely at the macro outlook, and instead the focus has turned to active stock selection. With fundamental analysis re-asserting itself, Leigh Himsworth looks at where the opportunities are for investors and which stocks are driving returns. After years of stagnation, earnings growth finally returned to drive global equity markets higher in 2017. In this webcast, Jeremy Podger assessed whether this dynamic will continue and revealed how it is impacting positioning in the Fidelity Global Special Situations Fund. As European growth accelerates, with the recovery broadening to Italy and France, will a return to normalised monetary policy rock the European boat or can it weather the storm? Alberto Chiandetti, Portfolio Manager of the Fidelity European Opportunities Fund, gives his outlook on the year ahead and explains where he is finding stock picking opportunities in Europe. As interest rate expectations have increased, value strategies have begun to perform following a long period of being out of favour. Alex Wright, portfolio manager of the Fidelity Special Situations Fund and Fidelity Special Values PLC, provides an update on his latest positioning and explains why a more uncertain and volatile backdrop will create some interesting stock picking opportunities. Fidelity Emerging Markets Fund Manager Nick Price looks back on a stellar 2017 for emerging market equities. He discusses performance drivers, the current market environment and assesses whether the asset class can continue to ascend in 2018. Hear Hyomi Jie’s first update on the Fidelity China Consumer Fund since taking over the portfolio in August 2017. Hyomi explains the fundamentals of her 3-step investment process and looks at the current positioning of the fund. She also takes a deep dive into one of her key holdings, Yum China, the largest restaurant chain in China, and explains why the food and beverage industry is an interesting sector of focus in Chinese consumer investing overall. Nitin Bajaj, portfolio manager of the Fidelity Asian Smaller Companies Fund and Fidelity Asian Values PLC, provides an update on his latest thinking. While large-cap tech stocks are attracting attention, he outlines why he’s not getting carried away by the euphoria. 2017 has been another year where politics and policy moves have dominated headlines at home and abroad, yet a number of major equity and fixed income markets have continued to grind higher and deliver decent returns. Can this continue in 2018? In a live and interactive webcast, Fidelity CIOs Dominic Rossi and Charles McKenzie will answer your questions and discuss the key issues equity and bond investors need to monitor in the year ahead. 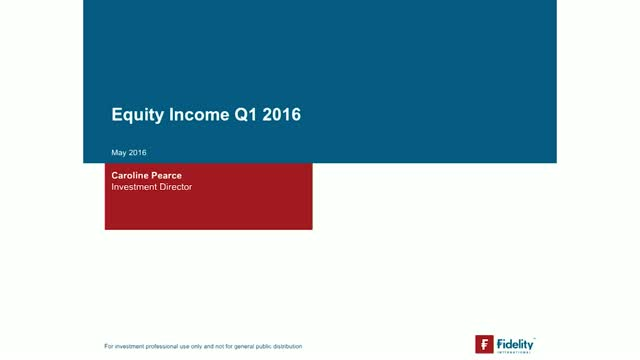 Listening to this webcast qualifies for one hour of CISI endorsed CPD. MiFID II represents a fundamental change for financial markets across a multitude of areas but what does this mean for your business and how might you be affected by the changes due to come into effect in January 2018? In a live webcast, Dan Hedley, Public Policy Director and Danny Wynn, Risk Programme Director at Fidelity International will explore the implications of the new regulations, explaining why we agree with the main principles and highlighting some concerns we believe have yet to be properly addressed. In this regular quarterly update on Asian markets, Matthew Sutherland, Head of Product Management (Asia), points out that the pull back in equity markets coupled with a more risk-on sentiment has resulted in flows starrting to come back into the asset class. Fundamentally Asian economies have some strengths, especially relative to non-Asian emerging markets. Matthew explores the China situation in some depth, first examining the challenges facing the country before elucidating some of its perhaps less often discussed strengths. He concludes by highlighting a couple of interesting fund ideas from the Asian equity range. In this quarterly webcast Stephanie Sutton gives her macro outlook on US equities focusing on the change of stance on US rates, recent volatility and recent data. While global growth saw some improvement in the second quarter of 2015, risks remain around the timing and pace of interest rate rises by the US Federal Reserve, uncertainty related to China’s long-term structural transition, and the impact of commodity-related moves. In this webcast, Anna Stupnytska gives her global macroeconomic outlook, assessing the prospects for growth over the coming months. Please join Steve Ellis in this regular webcast as he looks to explain Fidelity’s Emerging Market Debt team’s views on why, in a low yield world and despite soft fundamentals, emerging market debt continues to offer an attractive income for an acceptable level of risk. The asset class has enjoyed a strong start to the year, with the supply/demand imbalance created by inflows and limited debt issuance leading yields to come in. This has resulted in an approximate 4% return for hard currency debt over the year to date. Local currency sovereign debt currently yields around 6.4%, US dollar-denominated sovereign debt yields 5.7% and US dollar-denominated corporates yield 5.2%. This compares very favorably to yields on offer from various asset classes in the developing world; particularly when considering a significant proportion of this universe is rated investment grade. Emerging markets can throw up opportunities where one might least expect to find them. Please join Steve Ellis in discovering where the market opportunities lie. With the flexibility to invest across the fixed income spectrum, Peter Khan’s Global Income Fund aims to deliver an attractive income stream of 4% with an average rating of investment grade. The fund is designed to exhibit similar volatility to an investment grade portfolio through a full market cycle, but should enhance income by investing in Fidelity’s highest conviction ideas across fixed income assets, including satellite allocations such as Chinese Renminbi bonds and hybrids. During the webcast Peter will explain our ‘building block’ approach to asset allocation and the fund’s current positioning. Angel Agudo, the new Portfolio Manager of FF America, will provide insight into his investment philosophy and process on the fund, and will delve into where he is finding investment ideas. Additionally, he will also provide his views on the market outlook as we head into 2015.